The volume of essays provides 33 views on the future of our living spaces. Building culture is interdisciplinary, analogous and exciting. This volume of essays contains critical, committed and philosophical contributions by authors with very different backgrounds, including architects, engineers, theorists and filmmakers. They provide an atmospheric picture of the future of realities, ideals and possibilities for a better built environment. Berlin2050. Space and value. Exhibition at the Kehrer Gallery in Berlin from 24 November 2018 to 5 January 2019. Berlin is growing and changing in size, form and character. These changes should not be left to the market alone, they need superior ideas and strategies. After the first exhibition “Berlin 2050. Concrete Density” in 2017, The University of Texas at Austin and the Potsdam School of Architecture will present projects by their students on the theme of “Space and Value”. Panel discussion on 17.12.2018 at 19 o’clock in the gallery. On 6 November 2018, Karl-Heinz Bollmann, head of the Stadtsparkasse Bocholt, Mayor Peter Nebelo as Chairman of the Board of Directors of the Stadtsparkasse together with the architects Norbert Hensel, Rainer Wies, Bernward Schmitz, Managing Director of Oevermann and branch manager in Münster, as well as Daniel Zöhler and Joachim Schüling, City Planning Councillor, laid the foundation stone for the new building of the Stadtsparkasse’s head office. The work on the major construction site at Neutorplatz is fully on schedule and on budget. This was stressed by Karl-Heinz Bollmann, CEO of Stadtsparkasse Bocholt, at the symbolic laying of the foundation stone at noon on Tuesday. According to Bollmann, this first milestone was mainly due to the architectural firm Kleihues + Kleihues and the specialist planning. Mayor Peter Nebelo, who is also Chairman of the Board of Directors of the Stadtsparkasse, spoke of a construction project of significance for the city of Bocholt. “We assume that this building will prove to be a frequency generator for this part of the city centre.” Bollmann added that the new headquarters building project was a huge challenge. “We have been working on the plans for 10 years and are now happy to be able to lay the foundation stone for two attractive buildings. 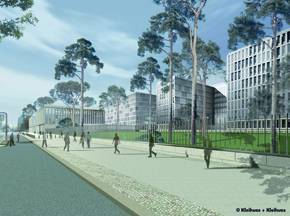 In addition to the headquarters of the Stadtsparkasse and P & C, future gastronomy, services and, of course, housing will also be found here. The 47 million euro construction project is expected to be completed in spring 2020. 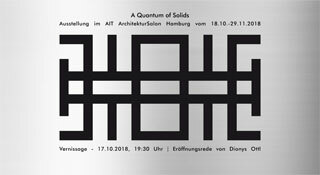 From 18 October to 29 November 2018, the AIT Architecture Salon Hamburg will present the exhibition “A Quantum of Solids – the headquarters of the BND” by the renowned Berlin architecture firm Kleihues + Kleihues. The exhibition shows the most important projects, buildings and objects of the architectural office, with a focus on the headquarters of the BND. The exhibition spans a wide temporal arc and presents five decisive projects from the past 20 years: the Haus am Leipziger Platz (2001), the Hotel Maritim (2005), the Hotel Concorde/Sofitel Hotel (2005/2018), the headquarters of the Federal Intelligence Service (2016) and the competition prize of the “Revolution of Dignity Museum” (Maidan Museum) in Kiev, Ukraine (2018). In particular, the Federal Intelligence Service – completed after almost 10 years of construction – is the focus of the exhibition, which provides exclusive insights into a building closed to the public. It shows how the challenging, multi-layered construction task of the largest project of the FRG after 1945 was solved by the Kleihues + Kleihues office, both inside and out, and provides a view of unexpected details. Selected photographs, models and façade patterns provide a detailed and exemplary insight into the work of the architects, whose design continuity on the one hand permits formal networking and relationships between the buildings, but on the other explicitly incorporates the surrounding urban environment, which places very different demands on the architecture. About place, function, order and freedom to beauty: lecture by Jan Kleihues on 11.10.2018 at the Architekturpreis Berlin e.V. The prerequisite for the design work of Jan Kleihues is the will to create. The aim is to find an adequate expression for each building task that goes beyond what is necessary. He develops designs from the cultural context and reflects the specific characteristics of the building task. Since architects have been trying to give shape to the world, the question of location, function, order and beauty has arisen from the perspective of the search for a definition of quality in urban planning and architecture. Design means making decisions, setting standards on the basis of which one must choose relentlessly, separating the important from the less important – and this anew for each building. These standards must be defined, weighed against each other and implemented in the respective design. Timeless and modern buildings can only be created if the criteria of location, function and order – which to a certain extent are complementary and mutually dependent – are taken into account. Buildings designed in this way are designed to last, and functional relevance and aging ability are the basic prerequisites for an economical and ecological use of existing resources. Beyond reason and discipline, it is important to preserve the freedom to strive for beauty in design and construction, because only in this way can a building acquire character and soul and defy arbitrariness. In his lecture, Jan Kleihues will present current projects and competition designs – including the new headquarters of the Federal Intelligence Service and the Kudamm Karree in Berlin, as well as the competition entry for the “Revolution of Dignity Museum” in Kiev. Welcome: Florian Mausbach, Chairman of the Architecture Prize Berlin e. V.
After the event there will be the opportunity for a personal exchange over snacks and drinks. Recognition as further training: The Berlin Chamber of Architects recognises the lecture evening as further training with 1 lesson/lesson unit. If you are interested, we will gladly issue you with a participant certificate for a processing fee of 15,-€. Please let us know when you register. On 05.10.2018 at 18:00 we invite you to the exhibition opening in the Spanish Embassy Berlin. Under the theme: MADRID. 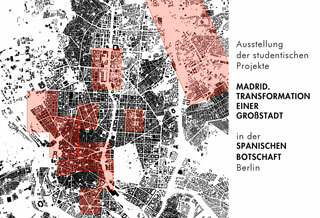 TRANSFORMATION OF A BIG CITY, students from the TU-Eidhoven and the Potsdam University of Applied Sciences developed designs for the Spanish capital. 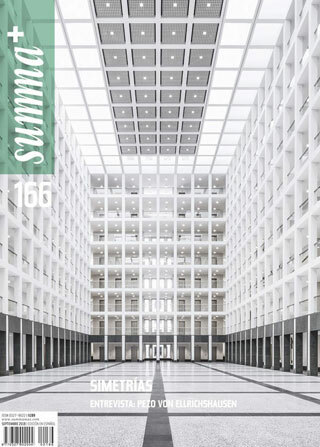 In its 166th issue, the renowned Argentine architecture magazine summa+ has devoted itself to the topic ‘simetrías’ (symmetries) and presented the new building of the Federal Intelligence Service in Berlin in a long article. In the foreword to this worth reading edition, the editors emphasize their special concern: “This edition returns to a topic that seemed to sink or forget, but in reality never disappeared from the agenda of the discipline: symmetries. (…) With the consolidation of architecture as an autonomous discipline governed by the academic system and the value system of the classical past, symmetry established itself as a canon of beauty, harmony and equilibrium that the works of art had to take into account. (…) The building of the Federal Intelligence Service by Kleihues + Kleihues reinforces with symmetry an interior design peculiarity that seems to convey a message associated with its function: structuring, hierarchies and regularity”. From 27 July to 13 September 2018, the AIT Architecture Salon Munich will present the exhibition “A Quantum of Solids – the headquarters of the BND” by the renowned Berlin architecture firm Kleihues + Kleihues. The exhibition shows the most important projects, buildings and objects of the architectural office, with a focus on the headquarters of the BND. 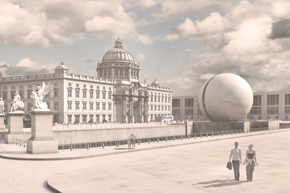 1st prize: Kleihues + Kleihues wins the international competition “Revolution of Dignity Museum” in Kiev. 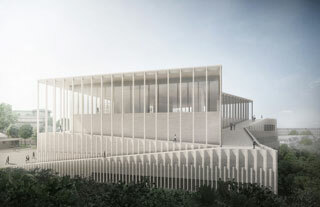 The architectural firm Kleihues + Kleihues was able to prevail against the competition in the international two-phase competition for the Maidan Museum in Kiev. Under the chairmanship of Prof. Matthias Sauerbruch, the members of the jury chose the design of Kleihues + Kleihues as the winner of the international competition “National Memorial to the Heavenly Hundred Heroes and Revolution of Dignity Museum in Kiev” on 27 June 2018. The office successfully emerged from the field of 15 participants (6 participants in the 2nd phase). The museum is intended to send a fitting signal to the tragic events on the Maidan in the years 2013/ 2014. The Maidan has become a symbol for the recent changes in Ukraine and the accompanying transformation processes – not only on a political level but also on a social and cultural level. The system developed by R&S Realty I GmbH & Co. KG was decided. Among the seven invited offices, Kleihues + Kleihues took 2nd place. 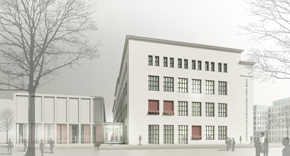 The subject of the competition was the design of a new office building in the Munich works district, including and renovating an existing listed building erected around 1920. 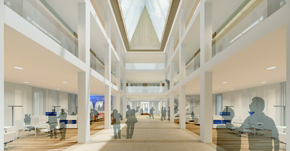 In the up to 6-storey new building of about 18,100 m², flexible rentable office space is to be created. The well developed area is currently one of the large contiguous development areas in the city of Munich. In the design by Kleihues + Kleihues, the new construction of the iCampus Rhenania plays a key role in the overall development of the works district. It forms the continuation of the urban figure of the adjoining Alpha, Beta and Gamma building blocks, defines an entrance situation by leading from Friedensstrasse to the iCampus, and together with the listed Rhenania building forms an ensemble that is to be the creative expression of a future-oriented and versatile working life. For the 7th time Kleihues + Kleihues presents itself again this year at the German Pavilion. As part of the official MIPIM programme, Jan Kleihues will give a Pecha Kucha lecture and illuminate two refurbishment projects with the current project Ku’Damm Karree and the completed H10 Hotel in Berlin. The date is Wednesday, March 14 from 10-11 am in Auditorium J. At our booth in the Riviera Hall with the number R.7.G38/17 you can visit us. With a high-rise model for the competition at the Güterplatz in Frankfurt, the office is showing its excellent contribution. Jan Kleihues and Fabienne Fontaine will be happy to answer your questions. To make an appointment, please send an e-mail to: pr@kleihues.com. MIPIM, the international real estate fair, will take place in Cannes/France from 13 to 16 March. It brings together the most influential players in all international real estate sectors – office, residential, retail, health, sports, logistics and industry. With almost 23,000 participants from more than 90 countries, MIPIM is one of the largest real estate fairs in the world. MIPIM takes place Tuesday to Thursday from 9.00 a.m. to 7.00 p.m., Friday from 9.00 a.m. to 3.00 p.m. at the Palais des Festivals in Cannes. On 18 December 2017, the book on the new headquarters of the Federal Intelligence Service in Berlin was published. According to the master plan of Kleihues + Kleihues, the gigantic building complex was built on a total property of approx. 10 ha, the main building alone has a gross floor area of around 260,000 m². Complex safety regulations and a challenging space program have made this construction task a project of superlatives. The high-quality volume provides exclusive insights into a building that will remain largely closed to the public and explains qualities and details using numerous photos and drawings. Berlin’s population is growing steadily – in 2050, more than 4 million people could live in Berlin. Where and how could this growth take place? What socio-political and cultural goals should be set and how should urban developments be designed to achieve them? Because the suburban spread of the city should be avoided as far as possible, the first of three exhibitions is devoted to the topic of urban density and the densification of existing urban structures. 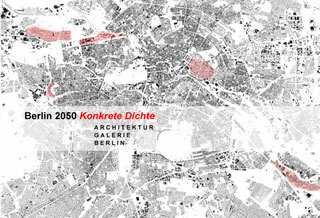 Part I of the exhibition trilogy “Berlin 2050”. Kleihues + Kleihues took second place in the prominent competition for the new office and hotel high-rise on Frankfurt’s Güterplatz. The already existing urban development concept was taken up for the tower at Güterplatz and confirmed by the submitted design. In the overshaping of the cubature, the design is restrained in order to expressively unfold its own identity via the façade. 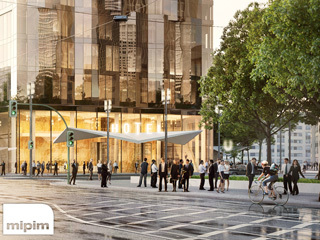 The façade concept allows oriels to be created that provide users with magnificent views of Frankfurt at almost 180°. 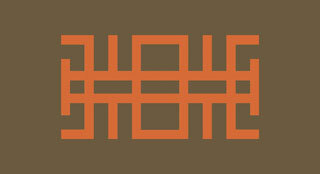 The façade rhythm is designed in such a way that an oriel situation is created in every hotel room. These oriels are generously glazed and represent a unique selling point, especially in hotels. The external effect of the folding results from the interaction with its materiality – the folds make the tower sparkle and give it its lively appearance. 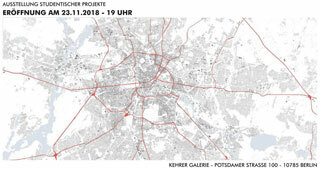 The first-class location between the exhibition centre, the main railway station and the Europaviertel is currently undergoing rapid development – four further high-rise buildings are being built in parallel in the immediate vicinity. A special feature of the site is the direct access to the U5, which will be next to the skyscraper from 2022. In 2014, the owner, Bosch, and the City of Frankfurt agreed that most of the apartments would be built on the site, as well as an office and hotel tower. This will be developed by Frankfurt-based project developer Groß & Partner from next year onwards. Construction is scheduled to start in 2018 and the high-rise is scheduled for completion in 2020. 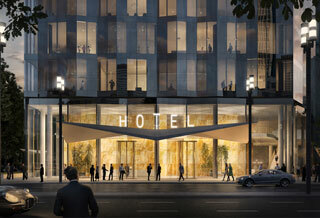 The hotel is scheduled to open the following year. 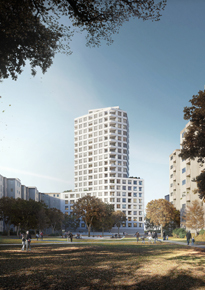 The architectural competition for the “Turm am Mailänder Platz” project development by STRABAG Real Estate GmbH (SRE) in Stuttgart has been decided. The Kleihues+Kleihues office took third place. In the limited competition with 8 participants, the jury found the three award-winning designs to be the best at solving the tasks required in the competition. Decisive for the committee was the successful urban integration and its design, especially in the context of the two other high-rise buildings and the city library. It also highly rated the development and connection to the public space as well as the functionality of the hotel uses. The design quality and materiality of the façade design, including the horizontal and vertical greenery, also had a decisive influence on the jury’s decision. The future use will be determined by various hotel concepts. A hotelier wants to offer 180 so-called long-stay rooms in the tower. They are intended for overnight guests who want to stay longer or value an apartment. In the lower part of the building, a British hotel chain is planning a conventional hotel with 270 rooms. In addition, there will be a gastronomic offer and a publicly accessible terrace with a city forest. “We are sure that we have found convincing designs for the location and our project with the award winners,” explained Uwe Jaggy, SRE Area Manager Stuttgart and member of the jury. 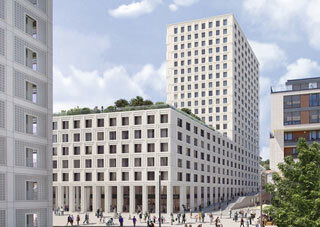 The tower on Milan Square is being built on a 1,800 m² site in Stuttgart’s Europaviertel. The development plan provides for a building up to 60 metres high. It is the last high-rise to be erected in the quarter. The new headquarters of the Federal Intelligence Service in the Chausseestraße in Berlin receives the ‘best architects 18’ award. 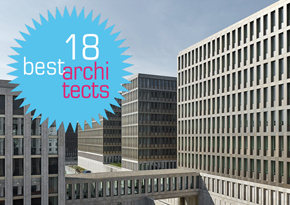 Out of 367 submissions, the label “best architects 18” was awarded 71 times. Irrespective of the size and prestige of the respective building projects, a large number of projects of the highest quality were selected. The jury, consisting of Prof. Verena von Beckerath (Berlin), Sou Fujimoto (Tokyo) and Prof. Ingemar Vollenweider (Basel), honoured 71 projects with the award best architects 18. The submitted works impressively demonstrate how diverse the European architectural scene is developing. In addition to well-known offices, it is always the new discoveries of still unknown offices that make the result particularly exciting. All winners will be displayed on the label’s homepage from 28 June 2017. 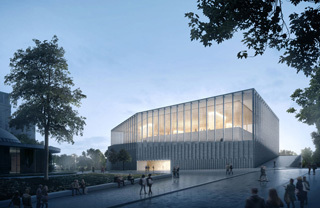 The New National Museum of Art, Architecture and Design in Oslo, currently under construction and designed by Klaus Schuwerk (Kleihues + Schuwerk), is part of the ‘New Museums’ exhibition at the Musée d’art et d’histoire in Geneva from 11 May to 20 August 2017. The exhibition shows 17 selected exhibition houses from all over the world that have recently opened or are still in the planning stage, and poses the question of what the contemporary museum should look like. In recent decades, the construction of numerous new museums has helped to rethink their role and place in today’s societies. These institutions, distinguished by their forms and ambitions, are examined in terms of their architecture, the economic, political and social problems they pose, and their respective cultural visions. Over the last thirty years, the New Museums have undergone profound changes. Factors such as demographic change, digitalisation and globalisation have shaped this radical development of the museum world. Thus, projects that have recently been completed, or are about to be completed, reveal a variety of tendencies that are sometimes contradictory and often polemical, as the very nature of museums points to the most sensitive aspects of our collective identities. 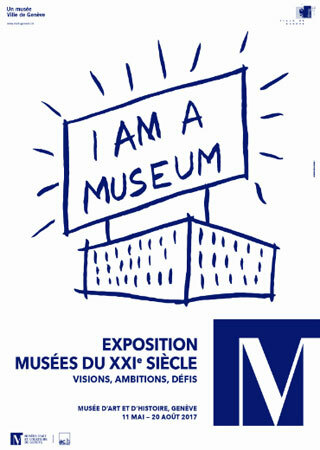 The exhibition, conceived by the Art Centre Basel on the initiative of the Geneva Musées d’art et d’histoire, presents the museum projects using models, plans, photographs or renderings, interviews or building elements in individual cube modules. Through spatial arrangements and approximations, these constructions allow a series of problems to become visible, which can be used to shed light on the main tendencies of the latest developments. You can find more information about the exhibition here. Kleihues + Kleihues won the 2nd prize in the competition for a type high-rise residential building. The aim of the HOWOGE competition was to find serial concepts and solutions for elementary and inexpensive construction, differentiated housing mix, good architecture with inner and outer flexibility as a reaction to different urban planning situations and, based on an optimised building footprint, to achieve a high efficiency in the ratio of living space to gross floor area. “The work is characterised by a very compact square basic form, whose advantages of directionlessness are worked out particularly for a flexible applicability. It is to be rated positively that a consistently thought-out construction in concrete and wood construction results in a high degree of prefabrication and that ecological and climatic aspects are taken into account. The division of the building into a massive plinth with special uses and the superimposed structure with generous openings and suspended log hygiene elements gives the type high-rise a striking appearance. 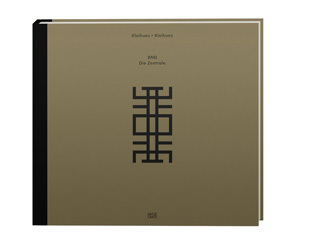 For the 6th time this year Kleihues + Kleihues presents itself at the German Pavilion. The focus is on the recently completed and handed over construction of the new headquarters of the Federal Intelligence Service in Berlin. The federal government’s mega-project with a gross floor area of 260,000m² was handed over to the client by the office at the end of 2016 on time and within budget. Kleihues + Kleihues is responsible for all work phases in Germany’s largest construction project after ’45 and presents the impressive building with a model and photographs. You can visit us at our stand in the Riviera Hall with the number R.7.G38/17. Jan Kleihues, Tobias Amme and Fabienne Fontaine will be happy to answer your questions. For appointments please send an e-mail to: pr@kleihues.com. MIPIM, the international real estate fair, will take place in Cannes/France from 14 to 17 March. It brings together the most influential players in all international real estate sectors – office, residential, retail, health, sports, logistics and industry. With almost 23,000 participants from more than 90 countries, MIPIM is one of the largest real estate fairs in the world. 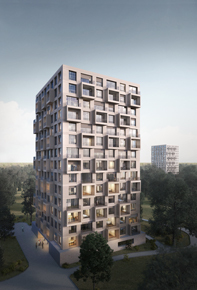 The design by Kleihues + Kleihues was awarded third place in the single-phase invitation competition for architects to the high-rise residential building on Theodor-Loos-Weg in Berlin-Neukölln. The awarding authority is the Beamten-Wohnungs-Verein zu Berlin, which is planning a high-rise residential building with up to approx. 23 storeys and a total height of up to approx. 80 m in the Gropiusstadt in Berlin-Neukölln on the corner property Wutzkyallee / Theodor-Loos-Weg. The competition area comprises a total area of approx. 20,976 m². Approx. 130 residential units are to be built, distributed over a maximum gross floor area of approx. 12,600 m². The design concept by Jan Kleihues with Johannes Kressner envisages that the new high-rise residential building, in addition to its main purpose of offering attractive living space, should make the leap from settlement to city without negating the character of the location. Kleihues + Kleihues won third place under the jury chairmanship of Prof. Christoph Mäckler. No first prize was awarded, two second places are shared by other offices. On Wednesday, 16.11.2016, the new “Luxury Hall” will be officially opened in the Alsterhaus in Hamburg. 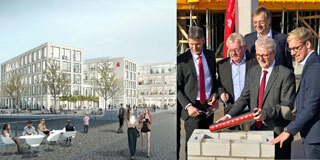 The official opening marks the successful first stage of the great transformation of the Alsterhaus. The structural measures of the completely new atrium were implemented according to the designs of Kleihues + Kleihues. 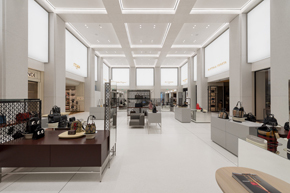 A generous opening over two storeys and a new route through the luxury department store on the Alster provide a completely new shopping experience. The new “Luxury Hall” is the prelude to the adjoining luxury boulevard, where selected international top designers present themselves. The classicistic structure and maritime atmosphere are on the one hand a clear commitment to the city with which the building has been interwoven for decades; on the other hand, the clarity of the atrium reminds one of the unadulterated, natural image of the coastal landscape and chalk cliffs. According to André Maeder, CEO of the KaDeWe Group, the innovation also reflects the claim to emphasise the local roots of the building even more clearly. The Alsterhaus is part of a comprehensive modernisation project of the KaDeWe Group, which includes the Berlin department store as well as the Oberpollinger in Munich. 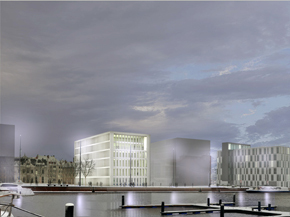 The Alsterhaus is to be modernised over the next five years for a total of € 80 million. Jan Kleihues has been appointed as a member of the Election Convention of Building Culture on 04.11 in Potsdam. Within the framework of this year’s election convention, convention members will be appointed, who will send representatives from their ranks to the Foundation Council and Advisory Board of the Bundesstiftung Baukultur. In addition, all members of the convent act as “ambassadors of building culture” throughout Germany. The Convention 2016 offers the opportunity to exchange ideas with building professionals and building culture mediators from all over Germany. 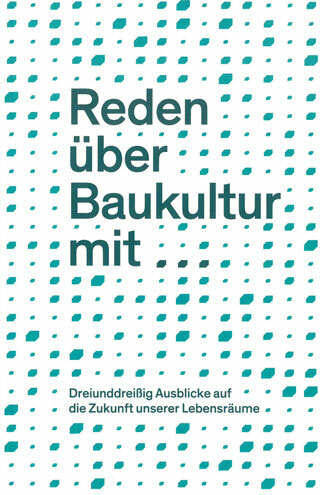 It has the task of carrying out a public assessment of the situation of the built environment in Germany and to pay tribute to special achievements in the field of building culture. The aim of the Federal Foundation for Building Culture is to broadly anchor awareness of good planning and building in society. The Convention of Building Culture is a public event. Participation by prior appointment. Jan Kleihues has been appointed member of the Advisory Board Master (M.Sc.) Project Development of the EBZ Business School – University of Applied Sciences in Bochum with effect from 05 October 2016. The interdisciplinary course of studies for architects and economists qualifies its graduates to take on management tasks in the real estate industry and in real estate business divisions. The EBZ Business School – University of Applied Sciences is a private university under the auspices of the non-profit foundation EBZ – European Training Centre for the Housing and Real Estate Industry. 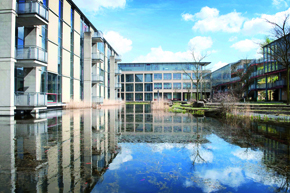 Since its foundation in 2008, the university has been a consistent further development of the Führungsakademie der Wohnungs- und Immobilienwirtschaft (FWI), which has offered continuing education at academic level since 1993 as an institution of the EBZ. The EBZ Business School is institutionally accredited by the German Science Council until 2024 and is committed to the freedom of teaching and research. The EBZ Business School prepares its students for careers in the business world with its state-recognised courses of study, focusing on individual support, practical relevance and excellent teaching quality. Recognition for Kleihues + Kleihues in the competition Hochschule für Schauspielkunst “Ernst Busch” in Berlin-Mitte. 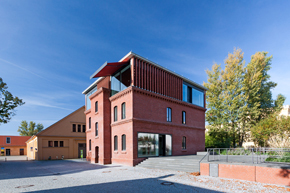 existing workshop building of the Stiftung Oper in Berlin to the main building of the university. Based on last year’s design competition, the Deutsche Gesellschaft e.V. is currently preparing an open-air exhibition on the Freedom and Unity Monument at the Schlossfreiheit in Berlin. This exhibition, which refers to the future national monument, marks its location and explains the significance of the monument, is sponsored by the Federal Commissioner for Culture and the Media and set up at the authentic location. It is planned to show all the competition works on the monument. The exhibition will open at the beginning of March. the jury will select two winning designs. 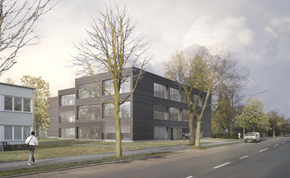 Kleihues + Kleihues shared the first prize with the Bremen office Hasob Kruse + Partner. Kleihues + Kleihues won the 3rd prize in the competition for the construction of a new main station Volksbank Lippstadt eG. The aim of the competition was to adequately portray the bank in the cityscape. 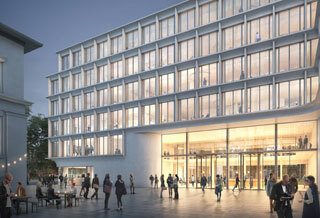 The Bank’s perception of Kahlenstrasse, Spielplatzstrasse and Cappelstrasse appropriate to design. The work will be carried out from 17 January 2011 at the head office of Volksbank Lippstadt eG, Kahlenstraße 30 – 36 in 59555 Lippstadt during opening hours.